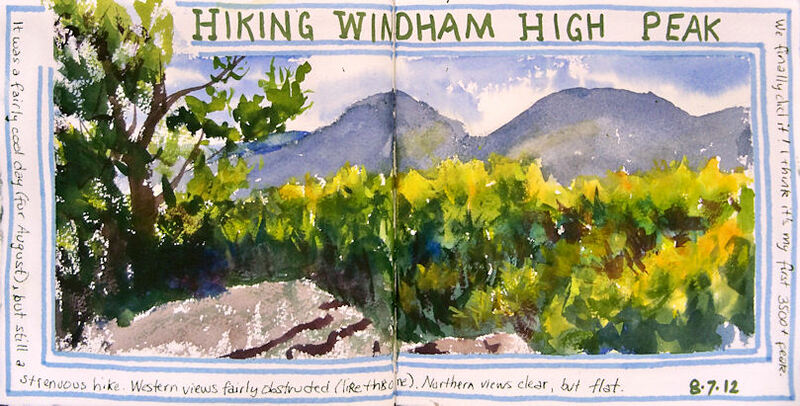 These sketches were painted during another one of the hikes I took with my husband this summer. We've always wanted to hike the old stage road up to the Catskill Mountain House site. It's a strenuous walk up the steep slope of the eastern escarpment of the mountains. We thought we'd be smart and leave one car at the bottom, drive up to the top where there's a parking lot, and walk the road downhill instead of uphill! We walked down leisurely, figuring we had all the time in the world before meeting friends later for dinner. As we arrived at the bottom, I realized that I'd left my car key locked in my husband's car at the top of the mountain! We had no choice but to turn around and walk all the way back up to his car. Needless to say, I don't think I'll ever make that mistake again when hiking point to point! My husband and I hiked up Windham High Peak. It was a long way to cart art supplies, but I packed light, bringing just my Arches 140# Rough custom hardbound sketchbook and a watercolor pan set. I had pre-taped the page borders to speed the process along, and did the writing (shown below) after returning home. Golden Airbrush Paints and Silverpoint Ground --- Who knew! Well, I was smitten with the possibilities of these paints! First of all, they are very highly pigmented, yet already in an ink-like consistency. This gives me an ideal solution to achieve watercolor-like pigmentation without the pigment disappearing on me. Furthermore, the Airbrush Paints have something that the Golden Fluids do not: retarder! Yep, the retarder is already added to the paint, so it stays workable longer on the paper, and can be lifted before it sets if you work quickly. The down side to working with these has been finding an easy way to use them on location while out hiking. I've been experimenting with a few different ideas as I've carted them around. This sketch of Kaaterskill Falls was done on location in about 40 minutes. The pages were prepared in advance with Golden Silverpoint Ground. I applied two coats, drying with a hair dryer in between. The idea was that by sealing the surface, it would be easier for me to make use of the lifting capabilities of the Airbrush Paints. On location, I coated the entire sketch area with Transparent Red Oxide mixed with some Airbrush Medium. Then I used a piece of paper towel, sometimes dipped in water, to pull out my lights, as if I were doing an underpainting in oils. I continued to work transparently for awhile, adding darks and pulling out lights, then used more opaque paint toward the end. I used a little Silverpoint Ground for some highlights and light, opaque color mixtures. It has a very heavy Titanium Dioxide content and worked great! I'd put about 5ml into a small empty vial from an ink sample. Transporting paints in a watery consistency has issues for sure. For one thing, I can't use the same palette that I can for oils or acrylics, nor any flat or disposable palette, for that matter. I ended up using two small, rectangular watercolor palettes that I taped together on one end so it could fold in half. I put velcro on the outside to affix it to my lap board with the sketchbook. That's worked out pretty well so far. I bring several of the small airbrush bottles of color with me, and pour them into the palette on location. Cleanup is a serious mess, and remains the biggest problem for me to resolve when out on location. 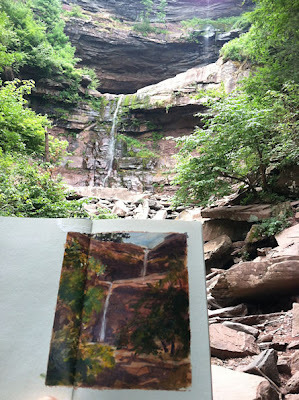 Here's a photo of the scene with my sketch. Unfortunately the sketch was in shadow and the scene in light, so it's a bit hard to see the sketch. 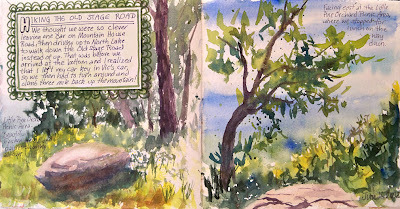 I decided to use one of the brand new Stillman & Birn extra heavy weight Beta hardbound sketchbooks to experiment with various grounds and mediums. The size makes it easy to travel with, so I've prepared a bunch of pages in advance and I take the book out hiking with me. 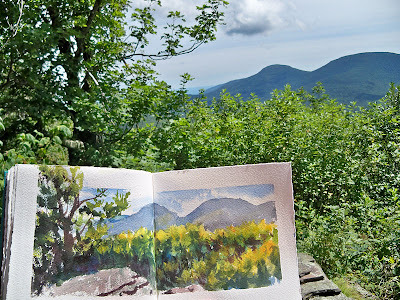 Since I have very little time to sketch on the hike outings, they serve double duty by allowing me to do my media experiments simultaneously. For this page spread, I used two coats of Golden Polymer UVLS Varnish (Gloss), rubbing it in with a paper towel to make as smooth a surface as possible, and drying the paper between coats with a hair dryer. 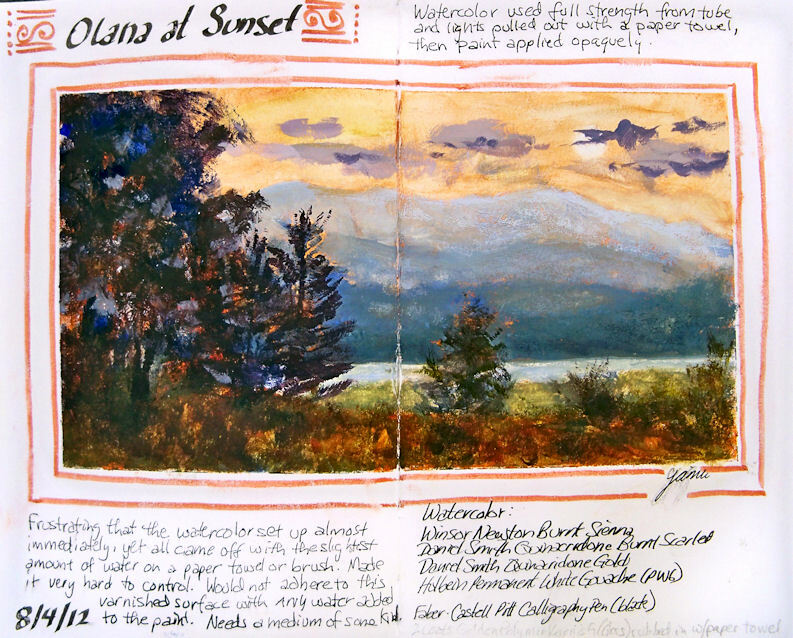 Then, off to Olana I went to do a rather monochromatic, tonal sketch of a sunset overlooking the Hudson River. 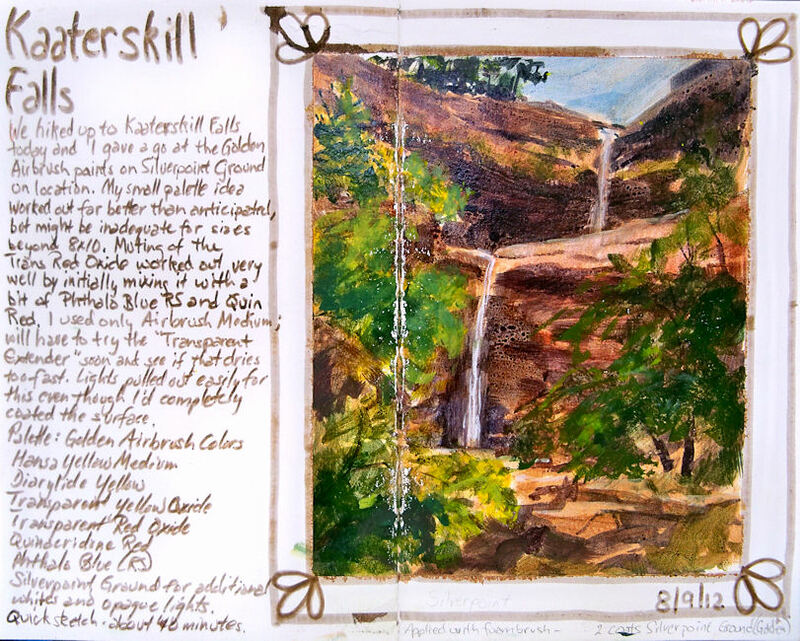 I used four tubes of watercolor: Winsor Newton Burnt Sienna, Daniel Smith Quinacridone Burnt Scarlet, Daniel Smith Quinacridone Gold, and Holbein Permanent White (gouache). The idea was to use the watercolor the way I'd use oil paint, since the varnished surface would allow me to pull out my lights right down to the paper, and enable me to use the paints in both transparent and opaque ways. 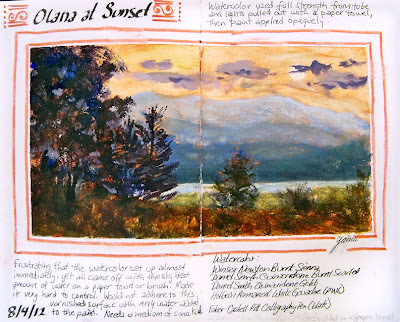 Landscape painter David Dunlop sketches this way a lot and does it very effectively! It turned out to be more of a challenge than I thought it would be. The paint had to be used full strength because any water added caused it to bead up on the surface. It dried very quickly and was hard to lift without adding water, yet when the water was added, it all beaded up and came off immediately, right down to the white of the paper. I think this will have great potential for me as a sketching method --- it was fast to work with, and not having to carry solvents nor worry about the paint drying out on the brushes makes it ideal for travel. It also lets me use the same techniques I use in oils. However, I'm going to have to try to find some kind of medium that can thin the paints yet doesn't bead up. I'm open to suggestions! It also has to be able to dry quickly enough so that I can close the book and put it back into my backpack without worrying about sticking. I'm looking forward to experimenting more with this idea. I think this is one of the busiest summers I've ever had. In addition to lots of painting and taking a one week workshop, I've been having such a great time with my husband while he's been on vacation that it's been hard for me to keep up with photographing images and writing posts. I've been sketching like a madwoman, so I've got a lot of catching up to do! 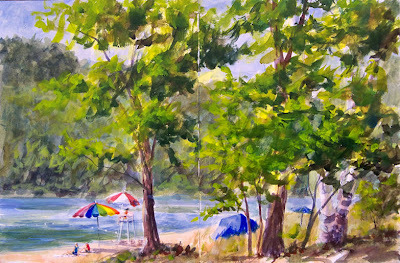 This was sketched on location at North Lake Beach while out painting with my friend Nancy. Sometimes I just don't want the pressure of feeling like I need to turn out a "finished painting", so I relax and play in my sketchbook. This was one of those occasions when in spite of wanting to work larger, I knew I wouldn't have time to complete a large painting. 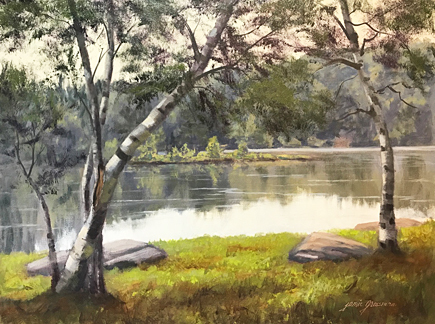 I couldn't stand the thought of yet another large, unfinished painting hanging around in my studio, and I didn't want to work small. It was just what the doctor ordered for this summer day by the water. I'm liking this scene a lot and will probably go back and do a painting from here sometime soon. 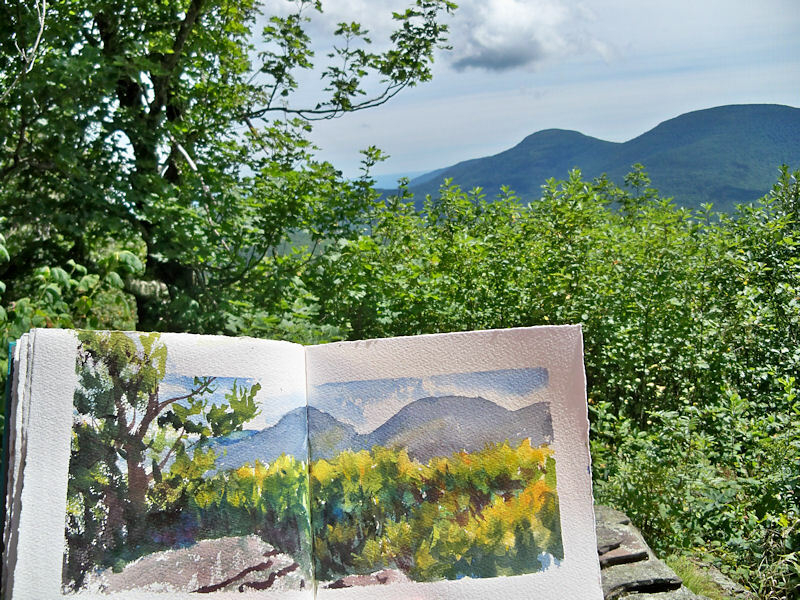 I'm loving working in these Stillman & Birn Beta Hardbound sketchbooks. The 180 pound paper doesn't buckle at all, and it's possible to experiment with all sorts of grounds and surface preparation, as well as any medium. I have an 8.5x11", and also recently started a 5.5x8.5" version for when I'm out hiking and can't carry such a large book with me.